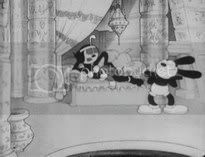 Classic Cartoons: Daffy VS Curly: "Woo-Hoo" against "Woo-Woo-Woo"
Have you ever noticed how this classic sequence from Clampett's "Porky and Daffy" (1938) echoes similar cuts and ideas in The Three Stooges' first real short "Punch Drunks" (1934)? In both cases we have "a secret way" to tramute the fighters (Daffy and Curly) into sure winners (a metal pan banged on Daffy's head/Larry playing with his violine "Pop goes the Weasel"). The basic structure of the sequences is also the same, with cuts from the ring to Porky/Larry running to find the pan/anything than can play "Pop goes the Weasel". And the same formula is also used in the fight sequence from Laurel and Hardy's "Saps at Sea", with Ollie going nuts as he hears the trombone playing. I wonder if Mike Tyson drew inspiration from this film. That was pretty funny, and I really don't even like The Three Stooges.